Ian Baraclough’s men are not going to give up their title without a fight. Evan McMillan celebrates scoring a late equaliser for Rovers. SLIGO ROVERS KEPT their championship challenge alive after Evan McMillan pounced for a late equaliser against St Patrick’s Athletic at the Showgrounds. Rovers were in danger of going seven points behind the Saints as the visitors led 1-0 through Anto Flood’s 16th minute goal. The assist came from Pat’s goalkeeper Brendan Clarke, who found the talented forward with a well-aimed clearance. The remainder of the first half was played at a high intensity but Sligo could not fashion a decent goal chance. The home side were the better side for long periods of the second half but Anthony Elding headed over when well placed at the back post. They needed their goalkeeper, Gary Rogers to claw out a Greg Bolger effort soon after. Ian Baraclough’s men continued to press and were rewarded when a ball was whipped into the box. A scramble in the six yard box ensued before the ball found Seamus Conneely. His looping header dropped to centre-half McMillan who finished crisply. With six minutes of injury time allowed, it was St Pat’s that pressed for the winner but Bolger blazed an effort narrowly wide before referee Tomas Connolly blew for full-time. The Dubliners stretch their league lead to four points, ahead of Derry City and Dundalk, but will rue the late concession of the McMillan goal. Drogheda United, eliminated from European competition midweek, had to settle for a 2-2 draw with UCD in Dublin this afternoon. United took the lead through Declan ‘Fabio’ O’Brien before Dean Clarke levelled matters. The Students hit the front after 55 minutes when James Kavanagh rocked home a free-kick after Drog’s goalkeeper Gabriel Sava handled outside the box. The visitors were level within 60 seconds, however, as O’Brien got his second. ‘Fabio’ was denied a hat-trick in the closing stages as he struck a post. 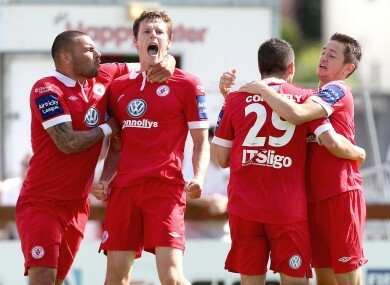 Email “Flood relief for Sligo as McMillan's late equaliser saves champs”. Feedback on “Flood relief for Sligo as McMillan's late equaliser saves champs”.